"Blue, liberty; White, equality; Red, fraternity... We looked very closely at these three ideas, how they functioned in everyday life, but from an individual's point of view. These ideals are contradictory with human nature. When you deal with them practically, you do not know how to live with them. Do people really want liberty, equality, fraternity?" Red, the final chapter of Krzysztof Kieslowski's Three Colors trilogy, is a subtle masterpiece. With its satisfying exploration of such complex and diverse themes as destiny and platonic love, Red is not only a self-contained motion picture, but a fitting conclusion to the series. Through one brief-but-important scene, this movie adds closure to both Blue and White, tying both to each other and to Red, and thereby reinforcing the commonality of ideas threaded through all three. This time around, the protagonists are a young woman named Valentine (Irene Jacob, who starred in Kieslowski's The Double Life of Veronique) and a crotchety retired judge, Joseph Kern (Jean-Louis Trintignant). Valentine, a fashion model, meets the judge after running down his dog in the street and taking the injured animal to the address listed on the collar. Kern is initially indifferent to his pet's predicament, telling Valentine to keep the dog if that's what she wants. She does; however, the animal eventually runs away and finds its way back to the judge's. When Valentine goes searching, she inadvertently learns Kern's secret - he enjoys spying on people by illegally tapping into their phone conversations. Told in parallel with the chronicle of the unusual friendship between Valentine and the judge is the story of two lovers that Kern spies upon. Auguste (Jean-Pierre Lorit) and Karin (Frederique Feder), seem devoted to each other, but fate has already cast its die against them. For Auguste's life is eerily similar to that of Kern thirty years ago and, like the older man, he is drawn by forces beyond his control towards Valentine. Thematically, Red is the strongest of the three films. Its construction allows hardly a moment to pass when the viewer isn't considering how fate manipulates the lives of Valentine, Auguste, Kern, and Karin - not to mention the characters from Blue and White (reprised oh-so-briefly by Juliette Binoche, Benoit Regent, Zbigniew Zamachowski, and Julie Delpy). Then there's the meaning of platonic love (or "fraternity") - friendship completely divorced from sexual overtones (maybe Billy Crystal's character from When Harry Met Sally should see this film). Kieslowski shows exactly how multi-faceted any relationship can be, and what occasionally must be sacrificed to the basic human need of finding a kindred spirit. Red also toys with foreshadowing in a very literal sense. A shot of Valentine used for a billboard ad ("A Breath of Life") presages something that later happens to her in real life. It is this moment, more than any other, that crystalizes everything that the Three Colors trilogy is attempting to convey about life and destiny. While Red lacks the emotional depth of Blue and the dark humor of White, it more than makes up for these with its textual and stylistic richness. The red-saturated visuals by Polish cinematographer Piotr Sobocinski are crisp and consistently atmospheric, and the score by Zbigniew Preisner is at full power (after being shunted into the background in White). The performances are without flaw. Irene Jacob is mesmerizing as Valentine, a woman unknowingly trapped in fate's web. As is true of the other female leads in the Three Colors trilogy, her acting ability matches her screen luminance. Jean-Louis Trintignant presents a multi-layered character whose final secrets are not revealed until late in the film. Frederique Feder and Jean-Pierre Lorit are solid in supporting roles. Red virtually demands more than one viewing for an appreciation of the picture's ambitious scope. Repeated examination of Red's narrative and thematic structure makes it apparent what Kieslowski has accomplished not only here, but through his entire trilogy. 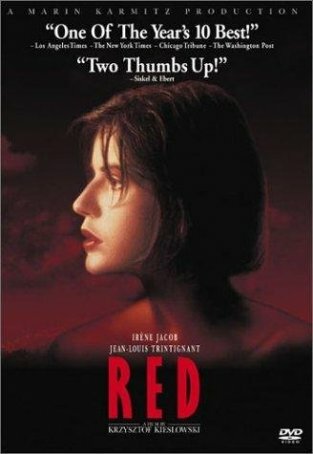 It's a tragedy that this movie will not be eligible for the Best Foreign Film Oscar (Switzerland, the country of origin, has decided to reject Red because of its strong French and Polish production elements), but the lack of official recognition does not alter the fact that this is one of 1994's exceptional motion pictures.